Ty Webb (Chevy Chase) suggested the pond would be good for Carl Spackler (Bill Murray) in Caddyshack. He didn’t struggle with his judgment. It was obvious. Today’s question is tougher and requires more consideration. Would Chevy Chase send Bill Murray to Rosa Mexicano or Dos Caminos? I won’t keep you in suspense: I’d send Bill Murray and Chevy Chase to Rosa Mexicano for the food and to Dos Caminos for the people watching. 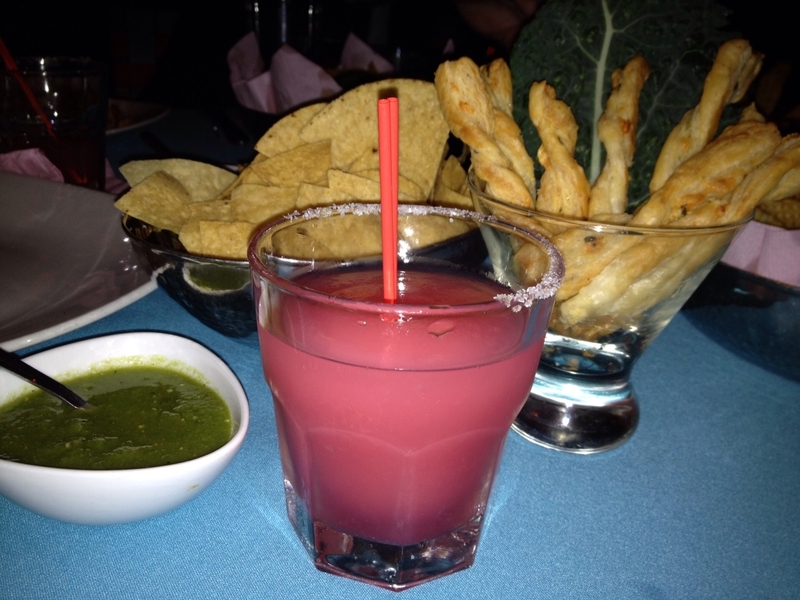 Rosa Mexicano has frozen pomegranate margaritas. They are pretty, pink and powerful. I’m legless after two. The guacamole is amazing and since they make it table side, I’ve been able to copy their recipe – Avocado, onion, jalapeno pepper, tomato, cilantro, sea salt – simple. This recipe fits into my purist, keep it simple, don’t like too much stuff in my stuff attitude about food. And I’m now the official guacamole maker for my friends. They say my guac is the best. Maybe it is or maybe they know the compliment will motivate me to make it – but either way, it’s Rosa’s recipe. I just add the love. My first Rosa experience was at the original location on the East Side (NYC). They weave some serious magic into their food because my most favorite thing on the menu is Rollo de Pechuga de Pollo – made with huitlacoche – corn fungus. When I say I’m a food purist, I’m putting the best spin on the reality that I’m picky and easily grossed out. Corn fungus violates at least 20 of my hard and fast food rules and not only do I eat it but if licking the plate was socially acceptable, lick I would. I even shared the Rosa experience with my mom. She had two frozen pomegranate margaritas (they’re too good to just have one) and she got tipsy and yes, it was my fault since she was drinking my Signature Drink. Dos Caminos is always packed and has a loyal following. I’ve betrayed a Rosa bias so I promise you that when I went to Dos Caminos this weekend, I took a panel of impartial judges (aka friends). The Dos Caminos guacamole is a little runny and unevenly seasoned. I think they use lime in their recipe and sometimes it overpowers the other flavors. I ordered a Prickly Pear Margarita (since it’s pink and frozen it seemed like a good contrast for the Rosa Pomegranate Marg). It was OK though it had a hint of something that made me nostalgic for the days when I thought Luden’s Cough Drops were candy. The tacos were cold and the service was slow. But on a day when everyone in Manhattan was out soaking in the first warm spring rays, slow service wasn’t a surprise. 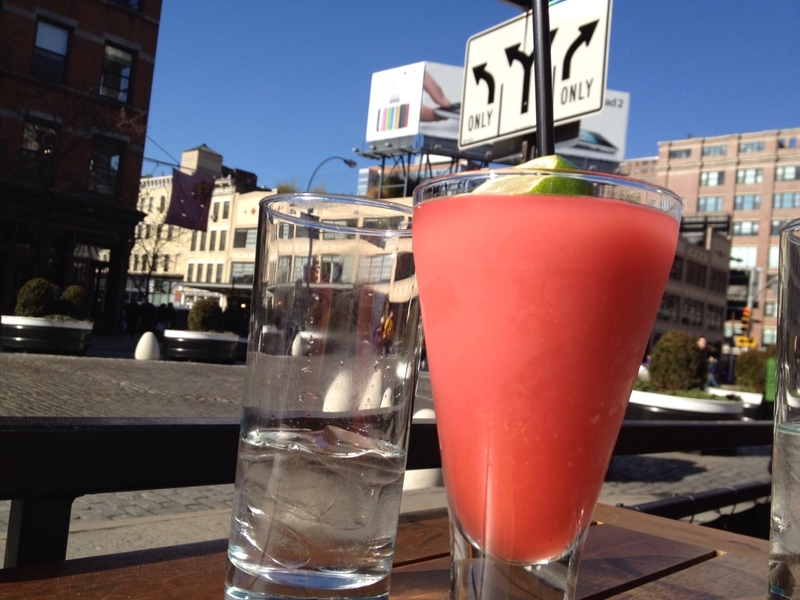 The Dos Caminos in the Meatpacking district might have the best outdoor seating in town, complete with unparalleled people watching and a helpful hostess who smiled even when faced with an endless crush of people waiting for tables. Dos Caminos also has multiple locations. Check out their site here. To be fair to Dos Caminos, my panel of impartial judges influenced food choices. They gave up fried foods for Lent so we couldn’t order the cobb salad (with fried chips for crunch) and we had to avert our eyes when waiters went by with outrageous looking french fries. I didn’t set out to write about these two chains in one blog post and really, they deserve their own special space. But when go to one, I often compare and contrast to the other so I suppose this format was predestined. I’ll be back to both with my panel of impartial judges and will write about Rosa Mexicano and Dos Caminos again when the mood strikes. But for today, my answer to the question of the pool or the pond is Rosa Mexicano. Mr. Chase and Mr. Murray, if you’re in NYC and in the mood for Mexican food, drop me a line. Dos Caminos Prickly Pear Marg al fresco!